Have you ever seen this displayed on a CD or a vinyl record? Well let’s stop right there. First you must realize that a digital recording can be converted to analog for playback on vinyl, and that an analog recording can be converted to digital so it can be played back on a CD. There is a lot of conversion from analog to digital and digital to analog that can occur in the process of recording and playback. So it really depends on where you begin the process as to whether it qualifies as a pure digital recording. This is because the instruments generating the sound are still analog instruments, the transmittal of the sound from the instrument to the microphone still travels through the air in vibrations (air pressure pulses), and the microphone itself still “hears” analog vibrations which it converts into an analog electrical impulse. The digital process begins at the point where the electrical impulses generated by the microphone are encoded onto a recording device. In the case of digital encoding, the first thing that must happen is to convert the analog electrical impulse into a digital code that represents the analog signal. It is from this point, called the “Analog to Digital Conversion”, that the basic underlying debate really begins. In order to “digitize” an analog signal, engineers developed a method of describing a sound wave’s attributes (frequency, loudness, waveform, etc) into a numerical code, a unique code for each particular “sample” taken. Keep in mind that the description is done for a particular moment in time, so if you have sufficient samples per second, and if your description is highly accurate then when played back this string of samples will sound very much like the original analog sound that it attempts to represent. When you look at a picture on a TV you see a picture which looks a lot like the original. But when you put your nose right up to the display you see the pixels that collectively represent the picture. The more pixels used, the more accurate the description is. In the case of a moving subject, the more frames per second, the more realistic and accurate the movement looks. In the audio digital world this is analogous to the sample size and the sample rate. As you can understand, the more accurate the descriptions are, and the more of these descriptions per second that are provided yield an image that will more closely represent the original analog signal, but it can never fully represent the analog signal because you can always improve on either the description or its frequency. So why is digital so compelling if it cannot quite achieve 100% accuracy? The answer is that once a sound is digitized, the remaining process can be largely free of the problems that accompany analog recording and playback. Your description of the digital recording and playback process is quite simplistic and incorrect. The comparison of digital audio output to looking at pixels completely misses the action of the analog output filter which takes out the “steps” in the sampled waveform, essentially removing the sampling “carrier,” as it were. 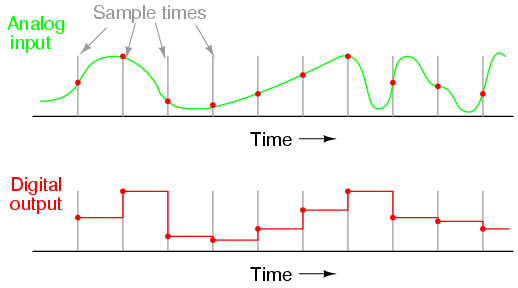 What comes out are reproduced analog waveforms up to 22KHz (limited only by the sampling frequency choice). I grew up with records. I have one of the best turntables made. But records have so many problems that never really got solved, even though they had a run from Edison to the 1980s. The biggest was dust and dirt. There were many attempts to deal with this without much success. Also let’s add wow, flutter, hum pickup from the turntable motor to the magnetic pickup, stylus wear, groove wear, variations in vinyl quality, resonances in the tone-arm/cartridge-cantilever combination, cosine distortion from off-center records. skating and inner-groove harmonic distortion, vibrations picked up from the motor (rumble), speaker feedback, skipping from footsteps, skips from over-cutting, surface noise, limited dynamic range, scratches and record warpage. CDs were a quantum improvement over records. Anyone who thinks otherwise most likely never had to put up with all the problems of vinyl. Theirs is just a romantic longing for a “simpler” age they never actually lived in. Well, you certainly have put forward a typical “digital is better than analog” argument. Hopefully someone who feels equally strong about the superiority of analog over digital will come forward with a statement of their own. My goal with these posts is to put the “analog vs. digital” into understandable terms for a non-technical reader. Despite my best efforts my writings were still criticized for being way too technical for some readers. My use of the visual world for analogies in the aural world certainly do fail (like all analogies fail) when taken too literally. But my point about sampling size and rates still holds water however. A larger sample size along with more frequent samples makes for a better digital representation. As this presents itself in the digital world I can accurately say that the DVD-Audio specification is vastly superior to that of the CD specification with regard to accurately representing a sound. I can also say that vinyl records have more potential information than the CD spec provides for. I can also say that any digital specification, no matter how good, can always be improved upon and never fully captures the native analog sound. This is analogous to reducing the distance to your goal in half; no matter how small it gets you can still cut the distance in half again and will never reach your goal. Any digital will never equal the native, analog sound, it can only approach it and approximate it. You have certainly made a good list of the problems with analog recording and playback. These problems do exist, but these issues can be “halved” just like the problems (that you didn’t mention) with digital representation can be minimized. So after all is said and done, digital comes up slightly short of the native analog sound while an analog representation has a bit of unwanted extra stuff (noise, wow, flutter, etc). Both can approach equaling the native sound and are close enough to make the point moot when considering that it has to be played back through equipment that will introduce way more distortion than the shortcomings of analog or digital. For me, the real world is always full of unwanted noise, so if an analog recording has some in there it just sounds more natural to my ears. Conversely, digital has always struck me as being so sterile, lifeless, and unrealistic. Personally I am good with both analog and digital existing side by side. But I can honestly say that I prefer listening to non-digital recording and playback. I say, to each his own.